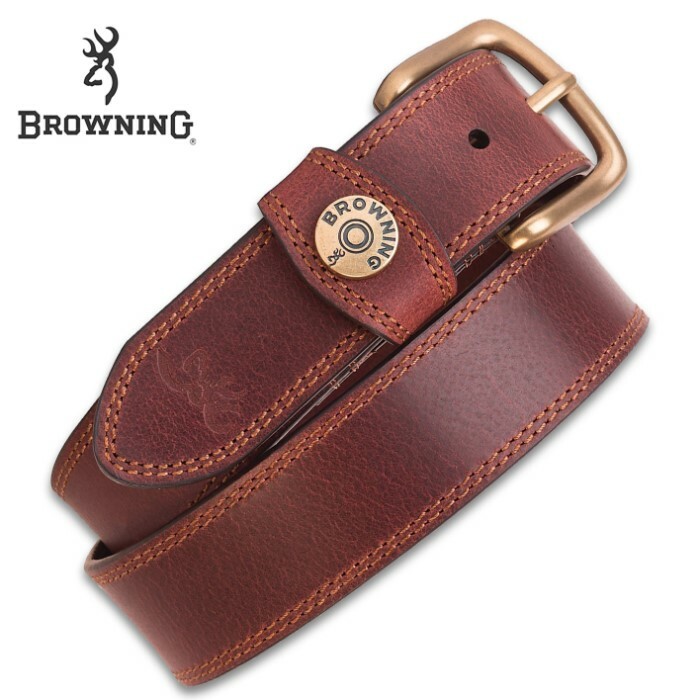 Browning Men’s Leather Slug Belt - Brown, Genuine Leather, Contrast Stitching, Shotshell Detail, Metal Alloy Buckle, 1 1/2” Width | BUDK.com - Knives & Swords At The Lowest Prices! The Browning Men’s Leather Slug Belt is absolutely a top seller with its contrast stitching and shotshell detail on the belt loop! It is crafted with genuine leather and has a metal alloy buckle with an Old English brass finish. This 1 1/2” width, leather strap belt breaks in nicely and will only get better with age. You can’t go wrong when you give this classic and stylish belt as a gift for any occasion!